HomeWhat Works on St. Patrick’s Day at Work? Having the maiden name of McClain, St. Patrick’s Day is a major holiday for me. So, at InfoMart, we begin our festivities in the morning and the fun never ends. Irish and non-Irish alike participate in St. Patrick’s Day, and when it falls on a workday, it is a pot of gold of employee engagement and a social media opportunity. On March 17th, we’re all Irish! St. Patrick’s Day is a great holiday to take your employee engagement program to the next level because it’s not a holiday normally recognized or celebrated within the workplace. InfoMart is a mid-sized business, so we are able to organize activities company-wide without major effort or disruption. In this job market, employees want a company with a unique culture, and small businesses and mid-sized businesses have an advantage when it comes to events like this. If you plan correctly and organize efficiently, it won’t take much of your time or your employees’ time, yet you are giving everyone a chance to laugh, participate, and partake in your culture. Read on to discover easy ways to celebrate St. Patrick’s Day in the office. Start the day festively. Most donut shops will have donuts with green sprinkles. Have a green-themed day. Provide green cupcakes (Amy’s green velvet cupcakes are my favorite). Go the healthy route. Supply an afternoon snack in the employee lounge of green vegetables (cucumbers, celery, broccoli, zucchini, and avocado dip) or make green smoothies. Get inspired by the rainbow. Design a fruit platter rainbow of strawberries, oranges, pineapple, green apple, and grapes. Provide an afternoon snack. Take an ice cream break with pistachio ice cream or green, frosted shamrock cookies from a local bakery. Host a potluck lunch. Invite everyone to bring an Irish dish with some traditional foods, like bangers and mash, soda bread, colcannon, boxty, shepherd’s pie, and potato bread. Share Bon Appetit’s Irish-inspired recipe list, and promote a cooking contest with prize money to get all the cooks working on their best Irish dishes. But don’t be surprised if not everyone jumps in to bring a dish. Be prepared with catering from a local restaurant to supplement the lunch in case employees attend but don’t participate in providing food. Promote learning and engage your employees, all from their own desks! Design a treasure hunt of information from your intranet. Send out questions during the day and have your employees “hunt” on the intranet to find the correct answers. Whoever replies first with the right link wins a gift card. Use St. Patrick’s Day to encourage your employees to “go green” by incorporating a recycling initiative into your celebration. Host a “Green Eggs and Cans” even. Have employees collect and bring in a bag of recyclable materials. Give each employee who participates an egg biscuit or a gift certificate to Chick-fil-A or Starbucks. Buy holiday props at your local dollar store—hats, glasses, and necklaces. Pinterest is a treasure trove of ideas and photo prop patterns. Have employees use them and take pictures, then post the best of your pics on your corporate social media. Put all your pics on the intranet and encourage people to post on their social media. Start this project early in the day and make sure to give employees the hashtags to use. 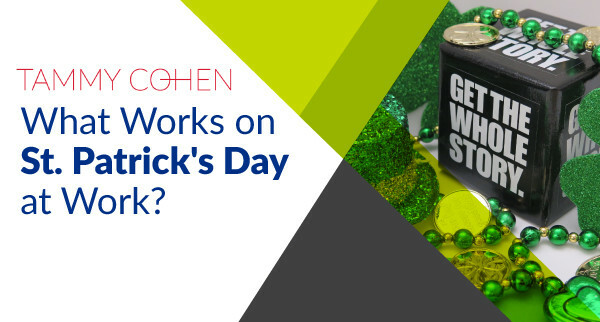 St. Patrick’s Day employee engagement activities don’t have to be over-the-top, but a few simple activities will recognize the holiday and change up the normal workday. Sláinte! Looking for more? Check out more ideas on my St. Patrick’s Day at Work Pinterest Board.